I was standing in a subway station waiting for the train when a man approached. He was dressed in a business suit and tie, shined shoes and not a wrinkle out of place. He had a pencil in his pocket. The pencil was his weapon; and when he came at me, I was frozen, my feet stuck to the platform like I was cemented there. He stabbed me. And the blood … well, I’ve already talked about the blood. 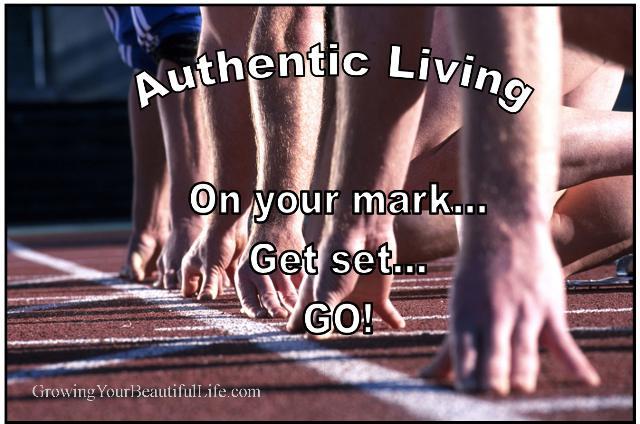 The starting line for authentic living isn’t always a pretty white stripe. The moment we realize we’re cemented into place – and that place isn’t what we really wanted … the moment we realized we’re dressed the way someone else wants us to dress, or we’re working in an environment where we never wanted to work … or we’re waiting and waiting for a train to move us forward to that place we want to be — well, that was the starting line for me, and I’ve been on the journey ever since. Authenticity is a choice, a transition, and a challenge. And it’s the most exciting approach to living I can think of. So if you’re in that place, your toes on the starting line, your adrenaline pumping, ready to go, I encourage you to run, walk or dance your way forward. And, hey, there are plenty of us ready to join and encourage you! So if you need some company, contact me! Come back. Leave a message. Let’s do this. Authentic Living – there’s really no other way to go. Repetitive dreams can be so unnerving. Authentic, transparent, intentional….have all been my words this year. Thanks for your post…moving forward to wherever God is leading. Such an interesting dream with a very useful message to get out there. I have just found your blog and look forward to reading more of your posts.